The Israeli government has been providing medical assistance to wounded “Syrian rebels” for more than a year. 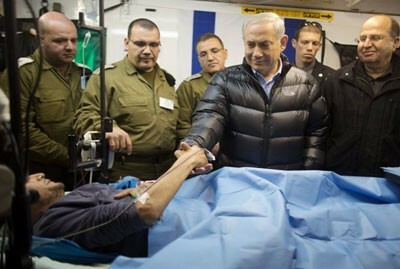 In February, 2016, Prime Minister Benjamin Netanyahu visited to a military field hospital in the Golan Heights medical facility where wounded “Syrian rebels” were being treated. He is pictured here with Defence Minister Ya’alon. Oh yes, and Trump also wants to bring “peace” to the Holy Land. And so he will move from the king of head choppers to the thief of Palestinian lands and end up with the poor old Holy Father who is wisely giving the President only a few early-morning minutes before his weekly general audience. Since the Pope described Trump’s views as “not Christian” – an unsaintly thing for Pope Francis to say of a mentally ill man – and Trump called the Pope’s words “disgraceful”, this is not going to be a barrel of laughs.